Would Belle And Beast Work In Real Life? I hate to admit it but I've been a fan of Beauty and the Beast for many years. I always find myself having Beast's temperament towards almost everyone. I always found myself attracted to certain women for beauty or having both beauty and brains. It reminded me how much I depreciated myself in high school over a woman who I thought was so hot when she was not (but she certainly was really intelligent) or how I actually had feelings for a simple-looking girl who had Belle's attitude. I just thought why Beauty and the Beast may not work in real life. Let's put aside the magic spells and just think of how Beast's attitude may be the reason why he's cursed that way. He's probably still biologically human as far as the story is concerned. The movie may have inspired the comedy "Beautician and the Beast". The beautician doesn't meet a man under a spell but a real monster. The widowed dictator doesn't treat his people right. He can't treat anyone right. Then comes the beautician who's mistaken to be a science teacher. The dictator of the fictitious country slowly falls for the beautician. But would it work in real life? I don't think any dictator would be easily dissuaded just because a woman came into his life. He's too used to having things his way and getting opposed is one thing he hates. I even wonder why didn't Joy the beautician get executed by the despotic ruler for simply opposing him? But again, what if the dictator himself wasn't that bad and had a soft spot. He wasn't that much of a tyrant either. Was Beast all that bad? He was pretty much of a control freak with how he ran everything. But there are times any man can get attracted to the woman who opposes them. Maybe he wasn't that bad and hasn't executed anyone out of mere anger or even forced Belle unto himself. Sure he blows his top every now and then but I don't think he's that bad as to attempt to do any harm to Belle. Maybe he's just a control freak who needed to learn to ease down. 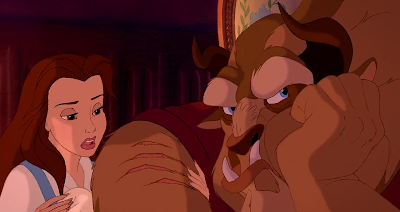 Remember Belle wasn't immediately attracted to Beast. Beast started to think of treating Belle as a guest instead of a prisoner after seeing the error of his ways. So maybe, the attraction wasn't instant. Beast started to see the error of his ways and both started a new journey together. So what's with Belle that could tame Beast? No it's not her outer beauty but her inner beauty. She's a very balanced person. She's submissive to her father but won't let anyone push her around including Beast. She repaid Beast's mistreating of her with kindness. Her personality defeated Beast's control freak behavior. Beast wasn't really a bad man... just a misunderstood guy who still had his boundaries. If he didn't Belle would have already met a bad fate. She stood up and Beast couldn't understand what he was facing. In the end, Belle tamed Beast's hostile personality which may or may not explain why they ended up with each other.